AeroPress on the left. Chemex on the right. 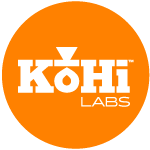 The KoHi code monkey went a bit bananas and decided to have a little contest. Chemex was filtered with their natural paper filters. The timing and kitchen lab was set up so that both brews finished with in a minute of each other. 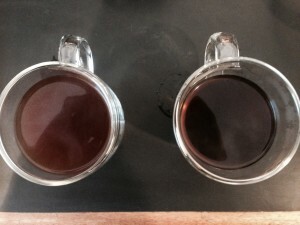 The product of both brews were fully poured into separate mugs. Both brews carried the same sweet and spicy odor. Almost like a strong natural root beer. Crazy…I know! The Chemex brew had very little opacity. The AeroPress had noticeable opacity. The Chemex delicately hit the palate with delicacy at the tip and a full flavor at the back. The Aeroress hit the palate with a strong body and a consistent flavor front to back. After swallowing, the AeroPress left a noticeable coat of flavor on the tongue where the Chemex did not. 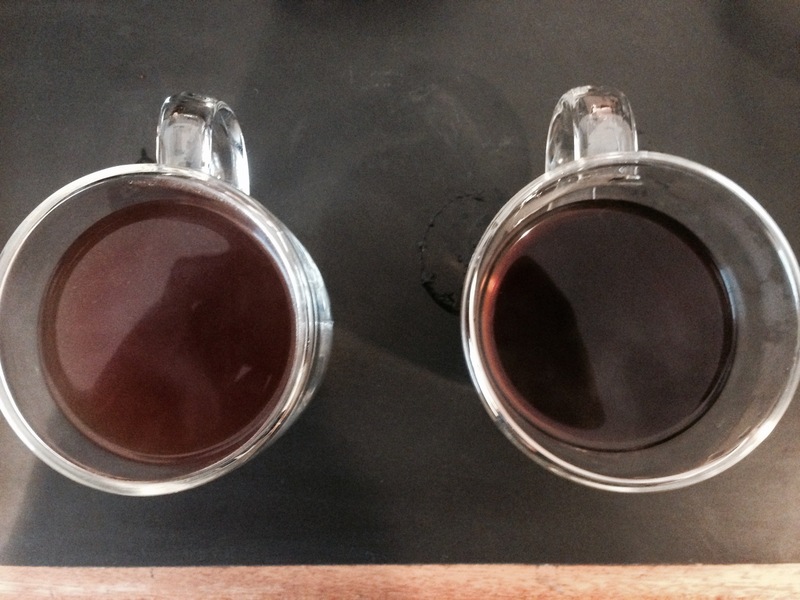 Both brews shared the same basic flavor as the brew settled across the palate. I was rather surprised at the similarity of the brew flavors. The difference in time and grind was significant, 2:15 on time and grain vs powder. In essence, the Chemex brew felt very clean and had more character in terms of it’s flavor changing subtly as the coffee moved from the front to the back of the palate. On the other hand, the AeroPress brew landed on the palate and stayed consistent across the palate. My sense was the Chemex taste, at the tip of the tongue, picked up a bit more of the odor from the nose while the AeroPress did not. Otherwise, both cups were excellent! If was trying to impress someone with the full capability of the coffee flavor profile, I’d probably brew with the Chemex. Personally, I enjoy the texture and consistent flavor profile I get with the AeroPress brew. Maybe stated another way…the Chemex felt like it needed to be sipped to fully appreciate the brew while the AeroPress presented a simple, “just drink me” brew. Wondering if the AeroPress flavor profile was caused by the particulates that pass through the mesh filter, I decided to pour the remaining AeroPress sample through a fresh and rinsed natural filter. Interestingly, the additional filter process did not significantly reduce the opacity and had little impact on the palate or nose. But, the opacity was definitely altered. So, I passed the the remaining AeroPress brew through a second rinsed and natural filter. This is where the test got interesting. Two things became apparent during the extra paper filtration process. The fine power size grinds pass through the paper, hence the gradual reduction in opacity. Two passes through paper filters were enough to pull the paper flavor into the brew. The Chemex brew (one pass through paper) tasted noticeably different that the final AeroPress brew (two passes through paper). Brew time has a complex relationship with the grind. It doesn’t take much time to get a good coffee flavor (e.g., AeroPress). On the other hand, allowing more time may pull in some other flavors without damaging the fundamental “coffee” flavor. Grind has an impact on the flavor profile too. The thicker grind and the longer Chemex filtration process seems to present a more “delicate” tasting cup. While not a part of this test, my experiments with thicker grinds in an AeroPress, all other recipe factors being equal, produce a weak and watery cup. While a finer grind in a Chemex clogs the filtration process. And that leads to the best take-away. Different methods produce inherently different cups. Not better nor worse, neither good nor bad…just different. And that’s kinda fun. The flavonoids in coffee are very complex. And the best roasters spend a lot of time cultivating their flavor profiles and relationships with growers. As a home brewer, it’s nice to know that the beans you purchase, the method you choose, and the recipe you create is the last step in creating your best cup of coffee. Getting a better cup of coffee by understanding regions and varietals.